The recent rate of divorce in Nigeria is unheard of since independence, the number of divorce case in the country is fast becoming unnumber just this week an Assistant Commissioner of police, Mr. Benjamin Wordu has told an Ibagwa-Ani customary court, in Enugu State to dissolve his 14-year-old marriage with his wife, Nkem Juliet Wordu. The ACP, who is the Area Commander, in charge of Onitsha Area command of the Nigerian Police, told the court that he was no longer interested in the marriage, accusing his wife of gross disobedience to his orders. A mild drama had played at the commencement of hearing on the matter when Wordu sat down during his cross examination, a development that was vehemently opposed by the counsel to the respondent, Barr. J.U Ugwuoke. The President of the customary court, Barr. Sunday Ugwude took notice of Ugwuoke’s objection and asked him to make his protest formal. Ugwuoke told the court that “I have never seen where anybody, no matter how highly placed, sits down to answer questions in the court. I therefore, urge the court to order the petitioner to stand up in respect to this court. If he must sit down, his lawyer must appeal to the court to allow him do so”. The application was not opposed by Wordu’s counsel, Ugwu K.A, who held the brief of Offorkansi Clement. N; consequently, the court ordered him to stand up. However, his counsel later made official request to the court to allow him sit down. The request was not opposed and as such the court then obliged the appeal. During the cross-examination, Wordu, who had earlier given his evidence on the 26th of April, told the court that prior to the present crisis-ridden marriage, he had another wife, who he divorced for undisclosed reasons. He admitted that the said first marriage produced a son, identified as Wordu Benjamin, Chinurum Jnr. It was gathered that having divorced his first wife, the Rivers State born police officer got married to Juliet, in 1999, a marriage that is also blessed with four kids. He admitted that Benjamin Jnr who was not living with him prior to his marriage with Juliet, moved into his house after the marriage, adding that the boy lived peacefully with the then new wife. Wordu, who was once the DPO in charge of Uwani Police Station, Enugu told the court that by the time he was going on transfer to Rivers State in 2009, they were already having problems in the marriage. One of the major issues he raised against Juliet, was that she allegedly despised his order and went ahead to buy a vehicle. “I told her not to buy any a car because at that moment, she was having problem with her contracts in the Prison Officers Wives’ Association, POWA. “She was the secretary of POWA, so I asked her to mind her business, which had to do with construction of some stalls”, Wordu stated, adding that the former Inspector General of Police also made efforts to resolve the crisis. “The wife of the former IG of police became aware of the problem between us when she reported the matter to them. The IG then directed the Rivers State Commissioner of Police and his wife to look into the matter”, he said. Wordu equally informed the court that he called for a family meeting, where he told his kinsmen of his wife’s alleged disloyalty to him by purchasing the car against his directive. He further disclosed that within that period, he was residing at Port Hacourt, while the wife and the children were in Enugu. “My wife is still holding my children; that’s why I am asking the court to allow me have them. I don’t know when she relocated to Abuja with them”. 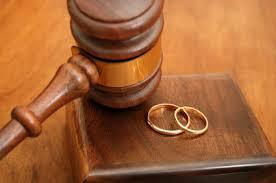 He alleged that he had it on good authority that his wife was getting married to another man. When asked to explain how he came about the information, he said one of his Nsukka in-laws, simply identified as Coach sent a text message to that regards. DailyPost equally gathered that part of the Area Commander’s grouse against the wife was the inability of his in-laws to attend his father’s burial ceremony. When asked whether he informed the in-laws about his father’s death he said: “I told my wife about it, and having done that, I believe it is left for her to tell her people. If somebody dies, a delegation must not be sent to inform people. I know that sometimes some people will just hear where people are crying over loss of a relation and they just run into the place without anybody inviting them and present whatever they want to the bereaved”. Meanwhile, Mrs. Wordu, who had during her plea objected to the dissolution of the marriage is to give her evidence on May 21.